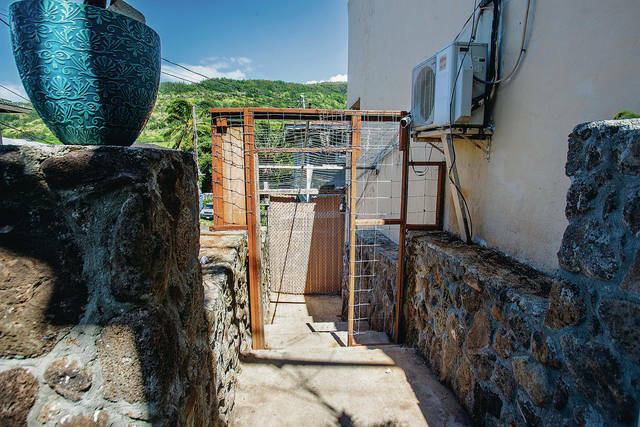 A makeshift wooden frame covered with wire fencing surrounds a stairway leading down to a heavy, blue-gray metal door at one end of a beige, two-story commercial building on Kalihi Street. There’s no sign to indicate what kind of activity is taking place inside the fortified entrance but the presence of surveillance cameras and the brisk exchange of people coming in and out of the place offer telltale signs of an illegal game room where customers feed money into an assortment of video games in hopes of a cash payout. The parlor is less than 50 yards across the busy street from Kalihi Uka Elementary School, which boasts a banner proclaiming it a 2018 National Blue Ribbon school. Authorities say similar operations can be found throughout Hawaii, including those run as stand-alone enterprises and in bars, mom-and-pop stores and other locations. A recent spate of violent crimes — robberies, shootings and killings — committed at these sites is renewing concerns about the lucrative and persistent underground gaming dens. So far this year, Honolulu police have executed 22 search warrants and made 39 gambling arrests, Brede said. Officers also have seized almost $200,000 to date “in cash, just cash” and an estimated $2 million worth of gaming machines. The cash-only game rooms often attract an undesirable crowd, said attorney Myles Breiner. Two years ago, Breiner filed a federal lawsuit on behalf of two men who were assaulted in an Ala Moana game room in 2014 by an on-duty, plainclothes Honolulu police officer while the officer and his partners unsuccessfully searched for a suspect. Officer Vincent Morre, who also hit a man in the head with a stool, pleaded guilty to violating the victims’ civil rights and was sentenced to 30 months in prison at a low-security federal prison in California. Honolulu City Prosecutor Keith Kaneshiro, who grew up in Kalihi and attended Kalihi Uka Elementary School, knows the nondescript, two-story building well. There was never a downstairs entrance before, he said. Kaneshiro said there’s been a resurgence in violence at game rooms because of all the cash that comes in. Some of the electronic gambling machines can cost as much as $5,000 to purchase from the mainland but can generate as much as $10,000 in just one week, he said. Because witnesses and victims are involved in illegal gambling activity, it’s often difficult to persuade them to testify in court cases or even report the crimes. The suspects “know they’re robbing an illegal activity, so the victims of the robbery are not willing participants in the criminal justice system,” Kaneshiro said. No one knows exactly how many underground game rooms are operating behind blacked-out windows, heavy security and surveillance cameras across Oahu. They typically don’t even offer liquor or food in order to avoid regulatory oversight. State Rep. John Mizuno, whose district includes Kalihi, said he visited a game room on the other end of the same two-story building on Kalihi Street eight years ago before it was shut down. Early Thursday evening, the legislator and his wife, May, accompanied by a reporter, went looking for the new location. After being pointed in the right direction by a cashier at a nearby business, the Mizunos walked past the wire cage and followed a man and woman down the stairs and inside through the metal door outfitted with a shiny, industrial lock. They were greeted by two large men who sat in front of a surveillance monitor that displayed different views of the entrance and building. Above them hung a hand-written sign that read “86 List” and included about a dozen first names of people who apparently are not welcome back. The dark room reeked of stale cigarette smoke. Any windows were covered by plywood, the cold glow of computers and video game screens providing the sole illumination. A window-­mounted air-conditioning unit circulated cool air and a stainless-steel microwave oven and white refrigerator stood near a bathroom. A man leaned against one wall counting a handful of $1 bills while four others watched a man play a video game about the size of an air hockey game. It was one of six identical games that one of the presumed bouncers referred to as “insect.” After inserting a $1 bill, players set about “shooting” as many robotic insects as possible. May Mizuno inserted $1 and asked how to play the game, as insects swarmed her onscreen “gun.” As the session expired, one of the bouncers left the surveillance monitor to come over and explain that she had to keep feeding the game with dollar bills and playing until she earned a minimum of $50 worth of credits to get paid, with a $50,000 limit. On the mauka side of the room, four players sat in front of separate video machines: one for draw poker, one for blackjack and two that offered a choice of several games including video slots. A hand-written sign said “3,000 max and 25 minimum,” which other players explained meant that a player has to win a minimum of $25 or a maximum of $3,000 to get paid. One-by-one, the four players left as their game sessions expired. John Mizuno played two hands of blackjack for $1 each and lost both times. His wife sat down next to him, inserted $1 into a different machine and selected a game resembling video slots. After about 15 minutes, the Mizunos left the game room $3 poorer. “Nah, just looking,” Mizuno replied. Honolulu City Councilman Joey Manahan said he believes there are at least a handful of unmarked game rooms in his Kalihi district. Manahan acknowledged the bill needs more research and work before it can advance and apply more bite to existing anti-gambling laws.